Enjoy this beautiful vacation cabin that includes gorgeous lake views from the living room and kitchen/dining space. This spacious 2br cabin has a loft with two twin fort beds (so it is really like a 3 bedroom cabin) and 1 full bathroom. With a queen bed in each of the bedrooms and a futon in the upstairs living area, it will sleep up to 8 on beds. The cabin's many windows go up to its vaulted pine ceiling and bring in a lot of light. A gas fireplace, AC, and satellite TV and DVD player are in the the living area which is connected to the open dining area and kitchen. Come visit this all season vacation cabin, great to relax and enjoy the great outdoors. You’re just steps away from the shore of Fish Trap Lake and the swimming beach. Plus, you have access to use a swimming raft and a variety of boats: kayak, canoe, paddleboat, and more. 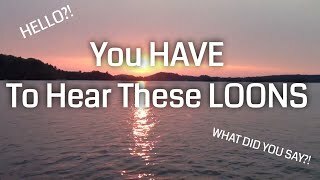 There is a huge dock for your use, either bring your boat or think about renting one from the resort. Larger groups welcome. The resort includes many amenities to keep you entertained: a volleyball court, horseshoe game, and a children’s playground. A variety of recreational activities at the resort and in the area include: swimming, boating, fishing, hiking, biking, golfing, go-karting, horseback riding, and more. If you want some structured activities, the resort has fun organized activities daily for all ages from woodworking to jewelry making. There’s something for everyone at the resort. End your nights around the resort’s campfire and look up to enjoy the stars while listening to the loons calling on the lake. In spring, summer, and fall, rates are based on the time of year and cabin size. In winter, (from Oct 1 - May 1), the rate is the same for all cabins and is based on 2 people. Over 4 people, each person is $25/night or $125/week during the spring, summer, and fall. Over 6 people, each person is $15/night during the winter (Oct. 1 – May 1). A week rental runs from Saturday to Saturday. There is a minimum 3 night stay from Memorial Day weekend to Labor Day weekend. There is a 2 night minimum stay for the remainder of the year. 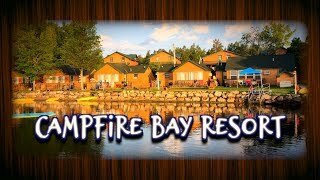 Campfire Bay Resort is the kind of place you thought didn’t exist anymore, the one you believed was just for the story books. Here is where you make lifetime memories the old fashioned way, while still enjoying the comforts of modern, updated and clean cabins. In a world of big box stores and big name sterile resorts a place really does still exist with a personal touch and old school charm. Bring the family and enjoy swimming on a sandy beach, fish on a great producing lake, sit by the nightly campfire or take part in the daily organized activities for the kids. Don’t forget about the ice cream at the lodge! Gather your family and friends to enjoy cabin time here. This is where you come and truly enjoy a relaxing, worry free vacation that will last forever in your memories and create stories for a lifetime. Come, be our guest. Heather and Brian Sams, owners for 16 years and counting!